The Amazon Echo as a murder case witness, legalities surrounding the Echo, technology-based evidence, and the impact on future cases. Recently, prosecutors involved in a 2015 Arkansas murder case have included Amazon’s Echo as technology-based evidence.The Echo is a hands-free speaker you control with your voice, connecting to the Alexa Voice Service to play music, provide information, news, sports scores, weather, and more. In this investigation, law enforcement discovered that the Amazon Echo could host important recordings and clues that are relevant to the murder case. On Lawyer 2 Lawyer, hosts J. Craig Williams and Bob Ambrogi join Andrew Rossow, cyberspace and technology attorney, and Craig Ball, a trial attorney and expert in digital forensics, as they take a look at the legalities surrounding Amazon’s Echo, technology-based evidence, and the impact on future cases. Craig Ball is a board certified trial attorney in Texas and an adjunct professor at the University of Texas School of Law teaching electronic evidence and digital discovery. For nine years, he wrote the award winning column on computer forensics and e-discovery for American Lawyer Media called “Ball in your Court,” and still pens a popular blog of the same name at ballinyourcourt.com. Special thanks to our sponsors, Clio and Litéra. Drew Rossow: There are instances or situations where privacy really becomes an issue and there is always a saying of — it’s not if a person is going to get hacked or violated or breached, it’s win. And obviously it’s never the intent of a person who is purchasing these devices whether it’s the hairbrush or any other sort of device to be compromised, but you are putting yourself out there, you’re putting yourself out into the cloud, your name, your birthday or your likes, your dislikes. And the more your device starts to get to know you, get to know your voice, get to know what your purchase history is like, through the Amazon cart, it makes it easier for other people to exploit that. Craig Ball: I think we should also look at the positive as well as the benefits for the legal system in having new sources of highly reliable information that will help us get a fairer and more adjusting quicker resolution of matters and dispute, as well as the apprehension and proof of guilt for those who commit crimes. With respect to having a device with a microphone that is based on the Internet, we have had those devices in our homes and offices for years, we call them laptop computers, we have smart telephone. So the potential for a device with an Internet-facing microphone or camera to be hacked is nothing new, and it is something that we accept, or at least many of us accept as a real but very remote risk with regard to our computers. Intro: Welcome to the award-winning podcast ‘Lawyer 2 Lawyer’ with J. Craig Williams and Robert Ambrogi, bringing you the latest legal news and observations with the leading experts in the legal profession. J. Craig Williams: Welcome to ‘Lawyer 2 Lawyer’ on the Legal Talk Network. I am Craig Williams, coming to you from a soggy Southern California. I write a legal blog called May It Please The Court. Bob Ambrogi: And this is Bob Ambrogi, out of a warm Massachusetts. I write a blog called LawSites. I also co-host another podcast on Legal Talk Network called ‘Law Technology Now’ with Monica Bay. J. Craig Williams: Oh, and Bob, I want to announce that my wife and I finished publishing our book, ‘The Sled’. It’s a Christmas book for children and our grandchildren are the named characters in it. Bob Ambrogi: That’s so cool. Glad to hear it. Congratulations. Bob Ambrogi: Well, before we get on to today’s show, I would like to first off start off by welcoming a new sponsor to the show, Litéra, the authority on document creation, collaboration and control. Increase your productivity, collaborate securely and ensure protection of your vital information, learn more at HYPERLINK “http://www.litera.com/”www.litera.com. J. Craig Williams: And we would also like to thank our continuing sponsor Clio. Clio is the world’s leading cloud-based legal practice management software. Thousands of lawyers and legal professionals trust Clio to help and grow and simplify their practices. You can learn more about them at HYPERLINK “http://www.clio.com/”clio.com. Well, Bob, recently prosecutors who are involved in a 2015 Arkansas murder case have included Amazon’s Echo as technology-based evidence. The Echo is a hands-free speaker you control with your voice, connecting to the Alexa Voice Service to play music, provide information, news, sports scores, weather, and more. Bob Ambrogi: In November 2015 Victor Collins was found strangled in a hot tub at the home of his friend James Bates. Bates was later charged with murder and has professed his innocence. In their investigation, law enforcement discovered that the Amazon Echo might just host important recordings and clues that are relevant to their investigation. J. Craig Williams: And a search warrant has been issued by prosecutors which requested access to all audio recordings, transcribed records, text records and other data from the Echo. Amazon has objected to the request and prosecutors are currently in negotiations with Amazon to obtain this information. So today on ‘Lawyer 2 Lawyer’ we are going to take a look at the legalities surrounding Amazon’s Echo and Alexa technology and its technology-based evidence, as well as its impact on future cases. So welcome to ‘Lawyer 2 Lawyer’, Drew Rossow. Drew Rossow: Thank you for having me. J. Craig Williams: And Bob, our next guest is Craig Ball. Craig hails from Texas but now happily calls The Big Easy in New Orleans his new home. A Board-certified trial attorney in Texas and an adjunct professor at the University of Texas School of Law. Craig teaches electronic evidence and digital discovery. He is an expert in digital forensic, emerging technologies, visual persuasion, electronic discovery and trial tactics, and he limits his practice to service as a court-appointed special master in electronically stored information. Craig is also an instructor in computer forensics and electronic evidence to multiple law enforcement and security agencies. For nine years, he wrote the award-winning column on computer forensics and e-discovery for American Lawyer Media called “Ball in your Court,” and still pens a popular blog of the same name at HYPERLINK “http://www.ballinyourcourt.com/”ballinyourcourt.com. Welcome to the show, Craig. Craig Ball: Thank you for having me. I am excited to get a chance to talk about the Amazon infrastructure and Echo. J. Craig Williams: Well, why don’t you start with giving our listeners a little bit of background about what it is that actually the law enforcement is looking for and what of that information might be available on the Echo? Craig Ball: Well, I think we need to start if I may by putting little context you described the allegations concerning the murder. Here we have several gentlemen watching a football game in the hot tub. The accused indicates he went to bed about 1 a.m. and left two of his friends in the hot tub and apparently woke to find one of them dead and floating in the water mysteriously. So we have a situation where it’s important to know the sequence and timing of events since the third party claims that he had already gone home and his wife would back him up and so forth on that sort of thing. And you also want to deal with the identification of persons in the room, when they were in the room, who was giving commands. Now assuming the Echo was by the hot tub and people were using it for various and sundry command purposes, playing certain music, asking what time it was, telling them jokes, etcetera, then you are going to have a record, not on the device but a record in the Amazon infrastructure that supports the Echo devices, that will provide not only the text of the command given and the time and date of the command given, but will also provide a full audio recording of the entire command, both a little bit before the command is given because the device has a loop that is always recording what it is hearing for a brief period in order to look for the so-called wake or activation word, whether that might be Amazon or Alexa or one of the others that can be set. So you have this record, in my case I have got a record of commands to my Amazon devices going back to October 13th of 2015, and I can go to the history on my Amazon application on my cellphone, on my iPad, and I can look in a rather laborious way and play each one of those commands going back for more than a year, and like my case going on a year and-a-half. And so I think what the Arkansas Law Enforcement folks are doing are covering their best. The people who sees the device probably didn’t fully appreciate that there is little if anything that can be obtained by analysis of the device itself in the same way that there is not a lot you would get by analyzing someone’s landline telephone concerning the content of calls, but you might be able to determine say the last number called through the redial. And the same thing with the Alexa Echo, the Amazon Echo is there may be in RAM possibly the last command given, but far more likely the unit is going to yield a potentially probative information by analyzing not the device itself but the information retained by Amazon in the Amazon Echo infrastructure, their cloud presence. Bob Ambrogi: Craig, just so I understand that loop — that archive of loops that you referenced. You said in your case you can go back to 2013, those are being stored locally on the device or they are being sent back to Amazon? Craig Ball: Well, let me clarify, but in my case it was till October of 2015, but at this point that just means that unless I choose to delete them individually or collectively, every command that I have given to the Echo wittingly or unwittingly, since they will sometimes say an activation word or it will sometimes think it heard an activation word what happens is, when the activation word is heard locally by the device, that then will open a communications channel over the Internet to the computers at Amazon. They will then take the transmitted audio after the activation word, will perform analysis on it for purposes of voice recognition, and will also store the audio stream. All of this is stored in the cloud and I can access it on another device, not on the Echo itself, but on my cellphone or my iPad by using the Amazon app. Drew Rossow: And just add to that, I know there is a — there is a voice training feature in the app that allows you to, I guess, better acclimate the Amazon device to the person who is going to be primarily using it. So if it’s myself or Craig or anybody using their particular device at home, the more voice training lessons that you do within the Amazon app, the more it’s going to listen and respond to that person’s voice rather than on the TV when you have an Amazon commercial or something sets off the Amazon device. You know what happens to me, I will have a commercial on TV and 11:10 will start talking, just because it thinks, it’s hearing a wake word. So those are little options that allow for a user to have a better control over their device and as opposed to having anybody that is able to control the device. Craig Ball: But let me caution if I may, I agree with that to a point, but anyone’s voice will activate the Amazon Echo. Although, it will fine-tune to the nuances of a voice by training, the fact is anyone who comes up and says the wake word it will be able to command. And this was what prompted my writing about this, early in 2016, I wrote a blog-post on Ball in your Court called ‘Alexa. Preserve ESI’, for electronically stored information. Bob Ambrogi: I am suspecting Tom O’Connor right there. Craig Ball: No, it was actually several others including my good friend “Ernie the Attorney” Svenson whom I think have known some of you as well. But it sounds like a Tom O’Connor thing. J. Craig Williams: One of the issues you know that’s going to be considered in this is what expectation of privacy you may have had in the information that’s recorded, and frankly, from the sound of what I am hearing, it doesn’t sound like you have much expectation of any privacy because you know that your information is going to be shared directly with Amazon. Drew Rossow: Oh absolutely. I think it’s a good point. I think it depends on the type of use that the individual has for the device. Generally anyone who is buying or purchasing a smart device plans on using it for a personal reason, whether it’s in their house or in their office, and it’s not for really anyone else other than immediate family or close friends to use. But I think the scope of that expectation is where these issues start to develop and that — when you start connecting your music libraries, or your calendars and your emails, you are not expecting other people to be able to access that or be able to extract an information whenever they want other than asking the device for that information. So I think how the device is being used at home or at the office, really starts to, I guess, draw out some sort of scale, but it’s a very tough question to answer in my opinion. Bob Ambrogi: I don’t understand why Amazon is storing in archive of these loops? What is the purpose in that in the first place? Craig Ball: I don’t think I can speak to exactly why Amazon is doing it, but it’s a relatively new technology, and it’s an interface that allows you to refine the command. So when you go through your history and you look at what Amazon did in terms of voice transcription and what you said, it allows you to make corrections and refine it. I think at this point it’s something you have the right to delete. I mean, I can delete an individual command and I can delete all of my history if I choose. For now, I think it’s a matter of being able to establish that what the Echo did in response to the command fairly reflects what the user interfacing with the device intended occur. I think this is especially important when the Echo is so capable of doing things like summoning an Uber, ordering a pizza, getting things from the Amazon retail site that you don’t want people saying, all of this stuff got charged to me via the Echo, I ask for a recipe for a pizza and the next thing I know 10 drivers from Dominos showed up at my door. So I think there’s a certain amount of working out the kinks in this relatively new form of interaction, when it can have fairly significant financial consequences. Bob Ambrogi: There’s the instance of the three or four year old girl who ordered some things from — sugar and a few cookies without her parents’ knowledge and they couldn’t figure out why goods kept showing up at their doorsteps. Drew Rossow: And that just goes to the same idea that we were talking about before is really anybody can talk to the Amazon device, no matter how much voice training you give it, as long as the person knows the particular wake word that is used to summon it. So if it said at Amazon or Alexa or Echo, as long as you know that word, you pretty much have control as to what that device can do. Bob Ambrogi: We are in this age, we are moving toward the Internet of Things. I was hearing a podcast actually from the Consumer Electronicss Show last week in Las Vegas, where all the new products roll out, and one of the new products they were talking about is a hairbrush that actually has a microphone in it. And apparently the hairbrush somehow uses the microphone to listen to the way you brush your hair, and help you brush your hair better. I mean, Drew, what are the — are there any limits on this from a privacy point of view? Is the general public opening themselves up, not just to law enforcement, but to other kinds of intrusions into their personal life? Drew Rossow: Absolutely, and a lot of times I think it’s inadvertently. People express a desire for more efficient ways of accessing information and doing things. And with that obviously there comes a price, whether it’s immediately or in the future. I think the more that people express a desire to explore these devices or these concepts, there are instances or situations where privacy really becomes an issue. And there’s always a saying of, it’s not if a person is going to get hacked or violated or breached, it’s when. And obviously it’s never the intent of a person who is purchasing these devices, whether it’s the hairbrush or any other sort of device to be compromised, but you are putting yourself out there, you are putting yourself out into the cloud; your name, your birthday, your likes, your dislikes, and the more your device starts to get to know you, get to know your voice, get to know what your purchase history is like through the Amazon cart, it makes it easier for other people to exploit that. Craig Ball: And that is the parade of horrible certainly, people need to be more aware of what their vulnerabilities might be. But I think we should also look at the positive as well as the benefits for the legal system in having new sources of highly reliable information that will help us get fairer and more just and quicker resolutions of matters in dispute, as well as the apprehension and proof of guilt for those who commit crimes. With respect to having a device with a microphone that is facing the Internet, we have had those devices in our homes and offices for years; we call them laptop computers. We have smart telephones. So the potential for a device with an Internet-facing microphone or camera to be hacked is nothing new. And it is something that we accept, or at least many of us accept, as a real, but very remote risk with regard to our computers. I love the Amazon Echo infrastructure. I use it throughout the day. I find it very helpful. I feel like the level of security that they have given me with respect to the use of the wake word, and the visual and auditory announcement that a connection is being launched to the web is adequate to protect my expectations of privacy. It is true that sometimes a mispronounced word or a television commercial for it or something else can trigger it, but it doesn’t trigger and silently begin streaming indefinitely. It makes the sound, it lights up. It only records for long enough to determine if it is getting a command or not. And then it shuts itself down. So compared to the many risks to privacy that we face in every sphere of our life, everyday, I think this is a very measured one. Bob Ambrogi: Well, given that Craig, let me just ask you, how much real evidence is there that law enforcement can obtain from one of these devices? Craig Ball: Well, again, we need to stop talking about obtaining from the device. And I know that — but obtaining from the cloud that connects to the device. We don’t grab the microphone, which is essentially what the Echo is. It’s a sophisticated long-distance microphone that you can turn on and off with your voice. We have to go to the infrastructure. So when I am dealing with my Echo, I assume most users know that they are actually talking to the Internet, because the Echo will announce if it has lost its Internet connection. I think it’s understood by users that without a connection to the Internet, the Amazon Echo is essentially a paperweight. So it’s a microphone. Once you get to the Amazon infrastructure, once you get to the records they have, and of course all of us who use Amazon, we know that there’s a detailed records of our purchases, of our reviews and so forth. There is a lot of information that we feed to a variety of commercial providers. Bob Ambrogi: I guess what I am saying is, out of a few second loop, I understand it’s in the cloud, but out of that few second loop that this device records, I am struggling to think about what the evidence is that law enforcement might get out of that loop? Craig Ball: Well, that’s a very good example. But we need to remember it’s indiscriminate in what it is recording. Anything that can be heard by any of its seven microphones in each device is going to be transmitted to Amazon. As a consequence of that, if there are other conversations going on, if there’s music or television in the background, if there’s a siren in the street, all of that is going to be transferred at any time the microphone goes live after the wake word. So I can envision a circumstance, where perhaps music is playing and you might want to know who ordered that song and at what time. It shows you that someone is alive at a particular point in time, which could be very important for the forensics when you have a body in a hot tub. The usual methods by which you would precisely determine the time of death are going to be radically altered by that external influence of the hot water. So knowing someone was alive until one or two or three is helpful. Not hearing their voice in conversation when a command is being given could be indicative, the fact that the command was given by one person versus another. I can see a situation where there might be a quarrel going on and somebody will say, Alexis, shut up, out of anger and frustration, and that will give you their tone of voice. It will give you the fact that there is an argument going on. So is this speculative, might this be something of a fishing expedition? Sure. But it’s amazing how much more information you get in terms of time and place and person and extraneous sounds that can be useful in determining facts that this device is capable of preserving and presenting to law enforcement or in civil cases with appropriate due process. J. Craig Williams: Before we move on to our next segment gentlemen, we are going to take a quick break to hear a message from our sponsor. Bob. Bob Ambrogi: Documents are the currency of business. They represent you in every business interaction. Executives need to know what changes have occurred in documents, what metadata risks exist, and how to encrypt, share and collaborate securely. Litéra simplifies the document creation and collaboration process to protect you from risk and loss of reputation. Litéra offers better solutions for document lifecycle management, so you can focus on doing what really matters. HYPERLINK “http://www.litera.com” www.litera.com. J. Craig Williams: And welcome back to Lawyer 2 Lawyer. I am Craig Williams and with me is my co-host Bob Ambrogi. Visiting with us today is attorney Drew Rossow out of Dayton, Ohio and attorney Craig Ball, an expert in digital forensic. Before the break, we were talking about Amazon’s Echo. And Drew, I will throw it right back to you. Drew Rossow: Sure. And I think, as we were discussing right before the break, I think this is part of Amazon’s argument is that it does seem to an extent like a fishing expedition in that you start to bring in a lot of the rules of evidence and possibly hearsay exceptions of, well, we are looking for information, but we don’t really know what we are looking for. So you start to look at it from an evidentiary standpoint of, well, what’s the purpose of bringing this information out of the cloud or taking it off of Amazon’s cloud infrastructure and how is it going to be used? And I think Craig has a very good point in that, you can name an infinite amount of hypotheticals, but you have to be very careful on the purpose for which the information is being sought for. And it starts to bring in a lot of these rules that are going to test the limits of technology. We are seeing it with the iPhone and how something can be unlocked and what’s the purpose of it, is it going to be offered to prove something or disprove something, and it’s infinite. So it’s very interesting to see. Bob Ambrogi: What are the implications here for civil discovery? Will this kind of data now be routinely requested in every family law case or every personal injury case that takes place in a household or anywhere where these devices might be present? Bob Ambrogi: Well, let’s put it this way, should they be routinely requested? Craig Ball: Well, the issue is not so much the request, but whether the obligation to preserve it is going to exist. I think that’s going to be the threshold challenge for lawyers, if this is reasonably anticipated to be probative evidence in the case, is there a duty to act affirmatively to preserve it and to prevent a client from either selectively or in toto deleting this history. So I even think the fact that a client or an opponent might go and delete all of their Amazon Echo history in connection with the litigation, it could itself be probative of their state of mind than their evil intent. Now, if we talk about this, if the police had come to this crime scene and it’s seen a digital camera sitting on the table by the hot tub or had seen a handheld recorder, I think we would have expected them to have seized those devices as reasonably anticipated to hold potentially probative data. In fact, one thing that’s interesting in this case in Arkansas is that the police appear to be making the allegation that the accused hosed off the area, arguably to hide blood or other evidence of a crime and ran 140 gallons of water between one and three a.m. on the night of the murder or the night of the death perhaps I should say, and so that electronic water meter data in and of itself may be probative. We have to consider the issues reasonably anticipated in each case, and if there is material probative data in a device or a source that is likely to prove or disprove those issues, I think as a general proposition that information needs to be considered for preservation and production, not just a, we want everything electronic so we can sift through it and see if maybe we find something, but there has to be a colorable reason, a viable theory that can be brought to a court and say, yes, I know this is somewhat burdensome or intrusive, but we really believe it will shed useful light on this event or this alleged event that will help us get closer to the truth. I think we all want to live in a world where crimes do get solved by the best and most trustworthy available evidence, and if some of that evidence is a happy accident of someone using an Alexa device or an electronic water meter or electric meter or a Nest thermostat or something like that, we want to get to the truth wherever it lies. J. Craig Williams: Do you think that this issue is really a generational issue and it will disappear with the next generation who seems not to be so concerned with privacy? Drew Rossow: I think when people start looking at these devices, at least in the millennials’ standpoint, I think I have three Amazon devices; I have got one of my office, one in my bedroom and one in the living room. I also have a Google Home. So I am pretty up to speed on the smart device technology, but a lot of people also don’t necessarily understand what they are buying. They look at it from a technology standpoint of, that’s really cool, that’s going to make my life a lot easier. I can connect my music. I can connect my calendar. Some cases we can connect certain programs that will read you off your cases for the day, so however you use it. But I think with our generation we started, I guess, I don’t want to call it a precedent, but a path to efficiency and constantly being mobile and having information on the go, and I think it’s hard to say what the next generation or so are going to be latching on to, but I think this sets the stage for what people start to expect in terms of sending and receiving information. J. Craig Williams: Drew or Craig, what are the obligations of the cloud host of this data when either law enforcement comes knocking or when civil discovery is taking place with respect to Amazon, what are their obligations to respecting the privacy of their customers? Craig Ball: Well, we have a bevy of federal rules and state rules that go to the issue of what an Internet service provider may and may not share without appropriate process. A subpoena from a private individual in civil litigation is unlikely to prompt a Google or a Facebook or a Twitter or an Amazon to surrender information, certainly not to a third party. They are going to demand a court order that specifically directs the information be provided, and they may have an expectation of being reimbursed or compensated for the cost of that, just as a bank is not going to freely surrender account information for a depositor and either expect to do it without legal process being served or without being compensated for the release of and collection of that information. I think this is very much influx, and the bigger question for me is how much control are we, the user, going to be given and right of access to repatriate this data. We have to be educated, that is to say people need to understand what they are giving up and what these devices are capable of doing, and that is a generational thing, I think. I think there’s somewhat greater awareness of the interaction with the cloud and a broader infrastructure than those of us who grew up with Legal Pad. But at the same token, we need also to have a means by which we can have a level of control, not just deleted in toto or listen to it laboriously one by one, but it means to be able to get copies of it, to bring it back to ourselves. In the same way as my bank allows me to download my transactional information from my accounts, but Amazon doesn’t allow me to download my transactional information in dealing with my Echo, and I think that’s going to be a problem in civil litigation as even if we have a duty to preserve and produce this, we may not have an effective mechanism to do it. J. Craig Williams: Well, gentlemen, we have just about reached the end of our show. It’s time for us to wrap up and get your final thoughts as well as to allow you the opportunity to share your contact information with our listeners so that they can reach out to you. So Drew, let’s turn it over to you. Drew Rossow: Sure. Well, as everyone has done the introductions, my name is Andrew Rossow. I am the Cyberspace and Technology attorney out in Dayton, Ohio with Gregory M. Gantt Company. I have a Twitter handle @Drossowlaw, Facebook handle is the same thing, drossowlaw, and I am open to any questions. And there’s any email inquiries, you can email me at HYPERLINK “[email protected]” [email protected]. Craig Ball: And I am Craig Ball. I am from New Orleans, Louisiana. I can be reached through my websites, HYPERLINK “http://www.craigball.com” craigball.com and HYPERLINK “ballinyourcourt.com” ballinyourcourt.com, my blog. I hope people will stop by Ball in your Court, and particularly if they are interested in this topic, look at what I have written about Alexa and Privacy. Thanks for having me. It has been a pleasure. Drew Rossow: And thank you for having me as well. Bob Ambrogi: It has been really nice of both of you to take the time to be with us and share your thoughts, really interesting, and really appreciate your taking the time to be with us today, so thanks a lot. Well, Craig, that brings us to the end of another show, any final thoughts on your part on this topic? J. Craig Williams: Yeah, it’s a can of worms. I think once you start going down that path, there’s very little retreat it seems like. There’s not really much of an expectation of privacy anymore, especially with the Internet. Bob Ambrogi: Yeah, I guess my concern is that a lot of people don’t understand the privacy that they are giving up with these devices and that causes me concern. I am not sure there is an expectation of privacy when you have an Alexa in your home, at least with respect to Alexa, but I am not sure a lot of people understand what they are giving up there. J. Craig Williams: Well, that brings us to the end of this show. And appreciate again our guests taking the time to be with us and appreciate all of our listeners taking the time to listen to the show. Join us next time for another great legal topic. When you want legal, think Lawyer 2 Lawyer. 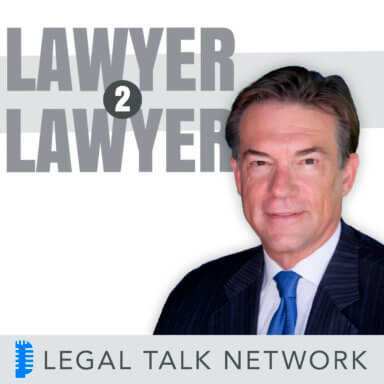 Outro: Thanks for listening to Lawyer 2 Lawyer, produced by the broadcast professionals at Legal Talk Network. Join J. Craig Williams and Robert Ambrogi for their next podcast, covering the latest legal topic. Subscribe to the RSS feed on HYPERLINK “http://www.legaltalknetwork.com” legaltalknetwork.com or on iTunes.